THE new Archdeacon of the Meon will be Canon Gavin Collins. He will become one of the three Archdeacons working alongside the Bishop of Portsmouth. He will have geographical responsibility for Church of England parishes in and around Gosport, Fareham, Bishop’s Waltham and Petersfield. 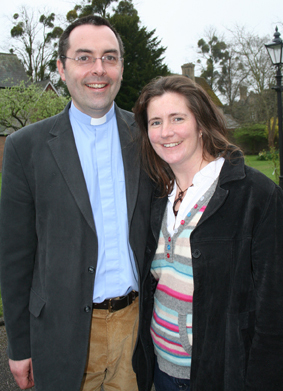 The 44-year-old has been vicar of Christ Church, Chorleywood, in Hertfordshire, for nine years and rural dean of parishes in the Rickmansworth area since 2006. He is also an honorary canon of St Albans Cathedral. He’s married to Christina and they have three children – Emily, 14, Susie, 12 and Harry, 9. The family will move to Fareham over the summer and Gavin will start work at the start of September, with an induction service in Portsmouth Cathedral. He will join the Archdeacon of the Isle of Wight, the Ven Caroline Baston, and the Archdeacon of Portsdown, the Ven Trevor Reader, as the bishop’s immediate senior colleagues. “I’m very excited about this fresh challenge,” he said. “My background is in a lively, evangelical church that is full of families. Being rural dean has given me a taste of working with parishes that are very different in character, and I’ve enjoyed that. It has inspired me to want to work at a new level. Gavin started life as a Methodist and became a Methodist local preacher. At university in Cambridge he worshipped in an Anglican church, and continued to do so as he worked as a lawyer in London, specialising in bankruptcy and insolvency litigation. He studied theology at Trinity College, Bristol, and was ordained in 1997. He spent five years as a curate at St Barnabas Church, Cambridge, which was a family church that ultimately attracted a number of students. He then became vicar at Christ Church, Chorleywood, which has around 400 people on its books. One of its daughter churches – which now has its own parish – is St Andrew’s, Chorleywood, from where the annual New Wine Christian festival was launched in 1989. Gavin will leave Christ Church, Chorleywood, just as a major £1.75m development is completed. He’ll be inducted as Archdeacon just a week after the Bishop of St Albans formally opens the new church complex there. He comes from a very ecumenical family. He has a twin brother, Simon, who is an elder in a Baptist church, and a sister, Caroline, who is a Methodist local preacher. Gavin is also a governor of the London School of Theology, and was a trustee of Latin Link, a missionary organisation that works in South America, for 15 years. In May, he’ll be cycling the 165-mile coast-to-coast route from the west of Cumbria to the North Sea to raise money for a school in Kenya supported by Christ Church, Chorleywood.